The Pufferfish derives its name from its remarkable ability to inflate itself by sucking in air or water. When a Pufferfish feels threatened, it will puff up its elastic stomach until it looks almost spherical. The Pufferfish is therefore also known as Balloonfish, Swellfish, Blowfish and Globefish. The ability to inflate itself is also found in the Porcupinefish, but unlike Pufferfish, the Porcupinefish is equipped with spines. There exists a wide range of different Pufferfish species in the world, and they all belong to the family Tetraodontidae in the order Tetraodontiformes. Many of the species are found in marine environments, especially near the shore or close to coral reefs. There are how ever also several Pufferfish species that inhabit brackish and freshwater environments. 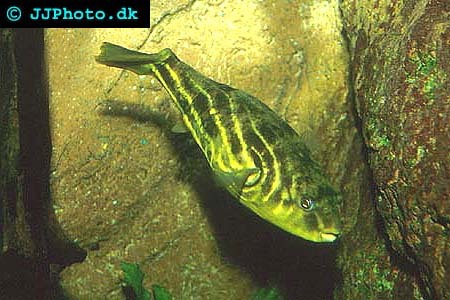 Below you will find a list that includes several examples of freshwater Pufferfish species. Whether or not a particular Pufferfish species should be considered a brackish Pufferfish or a freshwater Pufferfish is often subject to some debate, since there are several Pufferfish species that wander into both brackish waters and fresh waters. I have tried to list Pufferfish species that is commonly found in freshwater environments, but this does not mean that they never venture into brackish waters. You might be able to house one of the freshwater Pufferfish species in your brackish aquarium and vice verse. Always research the particular Pufferfish species that you are interested in more thoroughly before you get one, in order to find out which type of aquarium that is ideal for it. Colomesus asellus is a freshwater Pufferfish that is popular among aquarists since this freshwater Pufferfish is quite peaceful and can be kept in community aquariums. Despite its peacefulness, Colomesus asellus is however still prone to nip fins, a fact that must be taken into consideration when you choose its companions. Colomesus asellus is found in the Amazon basin in Brazil, Colombia and Peru. It is known by many names, including Brazilian puffer, Peruvian puffer, South American Puffer, and Asell's puffer. Provide your Brazilian freshwater Pufferfish with a large aquarium that have open swimming space. The fish will feel safer if you also include some cover and sheltered spots in the set up. In the wild, a Brazilian freshwater Pufferfish can grow up to 6 inches long (15 centimeters), but captive specimens seldom grow larger than 4 inches (10 centimeters). Keep the pH around 7 and the water temperature between 75 and 82o F (24 and 28o C). You can feed your Brazilian freshwater Pufferfish frozen and live meaty foods, such as mussels, bloodworm, earthworm, brine shrimp and snails. Tetraodon lineatus is a freshwater Pufferfish native to Africa and it is commonly known as Nile Puffer, Fahaka, or Banded puffer. It is not commonly kept in aquariums, since it is quite an aggressive species that will be violent towards it own species as well as towards other fish. Keeping your Nile puffer alone is therefore recommended. The fact that this freshwater pufferfish is aggressive does not mean that it is impossible to keep, and successful spawnings do take place even in captivity. The aquarium must be fairly large since the Nile Pufferfish can grow up to 18 inches long (45 centimeters). In captivity, it will however often stay around a more modest 10 inches (25 centimeters). It needs open areas to swim around in and you can feed it live or frozen meaty foods, e.g. earthworms, snails and mussels. The teeth of this fish grow throughout the entire life of the fish, and you must therefore provide your Nile Puffer with hard food, such as shellfish and snails, to keep the teeth at a reasonable size. This freshwater Pufferfish will tolerate soft to medium hard water. The pH should be kept around 7 and the water temperature between 75 and 78o F (24 and 26o C). Tetraodon lineatus a freshwater pufferfish.